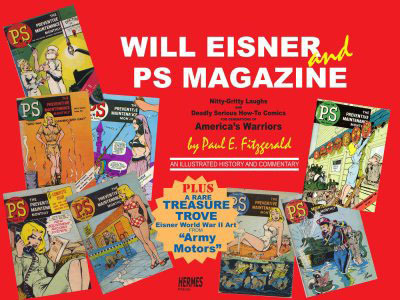 Here's the first penetrating look at Will Eisner's main body of work - strips, covers, illustrations, and designs for PS Magazine - produced in a 21-year period between his memorable and historic run of The Spirit and publication of his acclaimed first graphic novel, A Contract With God, in 1978. Fitzgerald was the magazine's first managing editor, and weaves together parallel stories - Eisner as an artist in expansive change, and the U.S. Army's daringly innovative publication that moved from early perilous survival and bureaucratic brinkmanship to 55 years (and still going) of recognition as a sweepingly successful communications pacesetter. Pre-order this book from Amazon. This page contains a single entry by GaryC published on March 12, 2008 6:44 PM. Paul Gravett on Will Eisner... was the previous entry in this blog. Frank Miller: The Spirit Production Blog #4 (The Evolution of Ellen Dolan) is the next entry in this blog.